Moore's Law - Credit: Intel Corp.
Moore’s Law – Credit: Intel Corp.
With the next generation Windows coming out shortly, and the recent release of Apples newest iPhone, along with a host of new web-enabled gadgets making their debuts at CES, we thought it was time to review some of the “Laws” of engineering. The observations from the last 50 years have predicated the growth of the electronics industry and hinted at where social networking would take us. 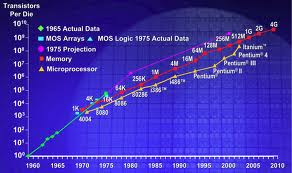 Moore’s Law – Gordon Moore, co-founder of Intel, observed that the number of components per integrated function seemed to be doubling about every 18 months. He envisioned that this trend would continue into the foreseeable future. What is amazing about this is that he created the original graph in 1965 and it still holds true 45 years later. In today’s electronics industry, the Law is re-stated as a doubling of the number of transistors on a chip, or a doubling of chip performance. This translates into a doubling of overall computational power approximately every two years. Viewed from a cost basis, the computing power that a $1,000 buys as followed this performance doubling line for the past 100 years. Rock’s Law – Arthur Rock, a Silicon Valley Venture Capitalist who has invested in high technology companies such as Intel, Apple, Teledyne and Scientific Data Systems noted that the cost of a semiconductor chip fabrication plant doubles about every four years. Rock was one of the original backers of Fairchild Semiconductor, assisting founder Sherman Fairchild when he was considering leaving Shockley Semiconductor Laboratories in the 1950’s. This is sometimes referred to as” Moore’s Second Law”. Butter’s Law of Photonics – Gerry Butter, Bell Lab’s / Lucent Optical Networking Division, postulated that the amount of data coming out of an optical fiber is doubling every nine months. Nielsen’s Law – Jakob Neilsen extrapolated that network connection speeds for high-end home users would increase 50% per year, or double every 21 months. As a corollary, he noted that, since this growth rate is slower than that predicted by Moore’s Law of processor power, user experience would remain bandwidth-bound. Until fiber-to-the-curb becomes a reality and home users can benefit from Butter’s Law, band-with will remain the limiting factor. Netflix, Hulu and the cable companies are particularly interested in this growth to sustain their on-demand business models. Sarnoff’s law – David Sarnoff, Radio Corporation of America (RCA), is attributed with the statement that the value of a broadcast network is directly proportional to the number of viewers. Bell’s Law of Computer Classes – Gordon Bell, who began his career at Digital Equipment Corporation (DEC) and oversaw the development of the “VAX” computer, described how computer systems (“classes” of computers) are developed, mature in the market and are replaced by the next generation. New computer classes are generally based on a new technology or availability of components. His theory was that about every 10 years there is an introduction of a newer, lower priced computational platform which will replace the existing one and develop into a new industry. Historically, the first computers were the very large single-purpose machines used by the war effort (e.g., University of Pennsylvania’s “ENIAC” – Electronic Numerical Integrator And Computer ) and later mainframes by large businesses. These were replaced by mini-computers and personal computers (PCs and Apples). These were augmented with the ability to connect through the wired Ethernet infrastructure. Later, personal handheld devices from RIM/Blackberry and Apple became prevalent in the market. Metcalfe’s Law – Robert Metcalf, a founder of 3Com and co-inventor of the internet, stated that the value of a telecommunications network is proportional to the square of the number of connected users of the system. His original idea in the 1980’s was premised on connected devices such as computers, fax machines or telephones, rather than individual users. However, his value proposition can be seen by the growth of companies such as MySpace, LinkedIn and Facebook. Haitz’s Law – Roland Haitz, formerly of Agilent, postulated a corollary to Moore’s Law pertaining to LEDs (Light Emitting Diodes). He states that every decade, the amount of light generated per LED package increases by a factor of 20, and the cost per lumen (unit of useful light emitted) falls by a factor of 10, for a given wavelength (color) of light. Faraday’s Law – The induced electromotive force (EMF) in any closed circuit is equal to the negative of the time rate of change of the magnetic flux enclosed by the circuit. This is the basis for wireless inductive charging used in the latest iPhones and other smartphones. A powered transmitter coil generates an oscillating magnetic field which in turn creates a similar magnetic field in a receiving coil. The smaller the separation between the two coils, as well as how closely they are aligned, the more closely the fields will match. The oscillating magnetic field in the receiver then produces an electrical current. Rose’s Law for Quantum Computers – This was attributed to Geordie Rose by Steve Jurvetson, suggesting that the number of quantum bits (“qubits”) in a scalable quantum computing architecture should double every year. Kryder’s Law – Mark Kryder estimated that magnetic disk storage density doubles annually. Koomey’s Law – Jonathan Koomey found that for a fixed computing load, the amount of battery you need will fall by a factor of two every 18 months. Reed’s law – David Reed, Professor at MIT, asserted that the utility of large networks, particularly social networks, can scale exponentially with the size of the network. Gate’s Law – This is an ironic Law that is named for Bill Gates, founder of Microsoft, although he in fact did not make this statement: The speed of software halves every 18 months. Parkinson’s Law – this postulates that work expands so as to fill the time available for its completion. SourceTech411 keeps you up to date on the latest in tech for news, reviews and product recommendations. Sign up for our newsletter (just an email required) to get the scoop from us direct to you. James Allen explores innovations in technology, consults on engineering projects and develops marketing solutions to grow businesses.